TOTALLY REMODELED! 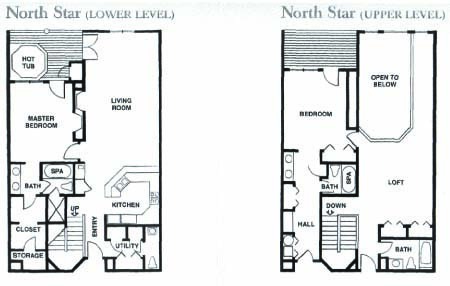 This 2-bedroom plus loft unit has 3.5 bathrooms and 2324 square feet of living space. There is a king bed in the master bedroom, 2 queen beds in the guest bedroom, and 2 queen beds in the loft. The kitchen has new granite countertops with new stainless steel appliances. The bathrooms all have new slab marble showers and countertops. There is a flat screen TV in each bedroom, the living room and the loft. The master bedroom has a wood burning fireplace. The stone living room wood burning fireplace stretches toward the vaulted ceiling and is decorated with a large elk head. Relax after a hard day on the mountain in the private hot tub located on the deck outside the living room and master bedroom with a view of Bald Mountain.